Virtual Mirror . . . Reviewed by Brian McGowan, released by Rock Company, December 2017. 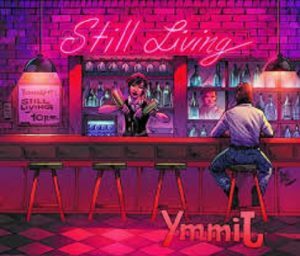 Third album now from Brazilian melodic rock band, Still Living, which uses a rather juvenile “image reversal” trick for its title, Ymmij. Though the alcoholic, pill popping protagonist staring at himself in the mirror is a nice touch. The cover art mind will remind you a little of Norwegian rock band, TNT’s ‘Realised Fantasies’, but only a little. The album is something of a mixed bag, with the band plainly still in thrall to Guns’n’Roses and Bon Jovi. Renato Costa’s vocal mannerisms, clearly aping Axl Rose’s raspy head voice on ‘Call Of The Night’ and guitarist Eduardo Holanda’s obvious mimicking of Slash’s swarming, slithery note bending style, most notably on opener ‘Reign Of Pills’, are distracting rather than attractive. That’s not to criticise the band’s love of the eighties/nineties melodic hard rock genre. An homage to an era, a tribute to the birth of a genre is fine, but much of this slips dangerously toward parody. AOR songs need to be imbued with a positive energy that’s hard to resist, filled with urgent vocals and well placed guitar heroics, without sounding obviously cliched or derivative. On a few songs, particularly, ‘King Of Nothing’ and ‘Haunted’ Still Living very impressively manage to do exactly that. There are just enough allusions to the melodic hard rock genre’s finest moments on these tracks to suggest a successful future. But elsewhere, a sense of identity is posted missing. So near yet so far. Next time perhaps.